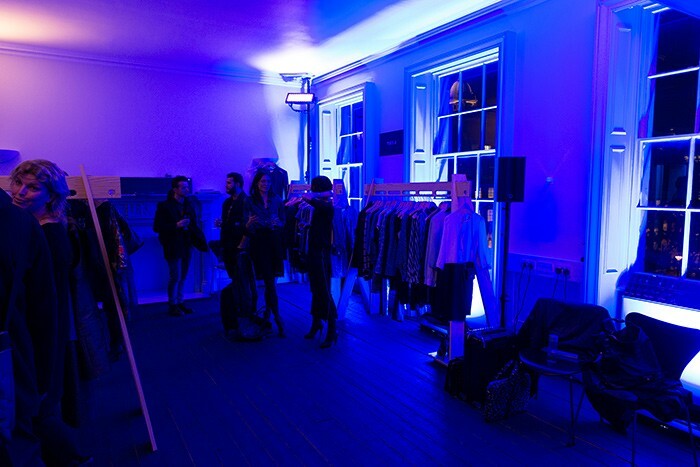 UK - Hawthorn pressed their new fleet of SGM P-5 washlights, both RGBW and TW (Tunable White), into service to implement a concept by one of Denmark’s most creative lighting designers, Søren Peglau, during London Fashion Week recently. The event at the Danish Embassy in the UK capital was sponsored by ‘Re Present’, a collective made up of fashion houses originating from Scandinavia. Hawthorn project manager, Sean Ferris, was introduced to the event by SGM Senior Area sales manager, Henrik Kloster, and SGM UK’s Matt Wiseman. Having purchased 72 P-5s, which were used to wash both the interior and exterior of the building, the company also supplied 34 SP-6 SixPack Blinders. 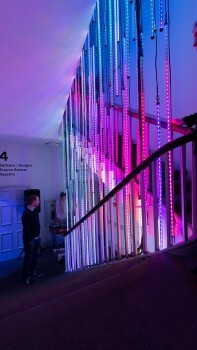 Meanwhile, Hawthorn contacted another SGM customer, Chris Morgan at Blueprint Event Services, who provided an SGM LT-200 3D pixel tube chandelier as an architectural feature over the main stairwell, using nearly 200 of the mesmerising rods and around 80 ILD Artnet pixel drivers (operating under Madrix control). Hawthorn ran the lighting through the venue’s existing Cat5 system and back into DMX, using the existing power, with distribution through 14 rooms, a café and reception area. The designer’s role was to complement the interior design by Studio Hato, making every hallway, staircase and the general traffic areas in a cold white and the brand rooms in a warm white in order to entice visitors inside. “The tunable P-5s did a very good job in the brand rooms, as I could adjust the intensity and the colour temperature so the room had the exact visual strength for the brand to be shown in. The SixPacks were placed on the balcony as an LED array pointing out towards the street; running white on a warm amber background during the day, these could easily be seen at the end of the adjacent park. “People were stopping to see what was going on, so this ‘eye candy’ really worked,” said Søren. In the evening the SixPacks focused their role onto the facade. With the exception of a few random cues, all SGM fixtures were programmed so they colour matched to each other, to maintain uniformity and a clean approach. The three Scandinavian country flags were highlighted, one in each window, by the P-5s before being lit simultaneously by the SixPacks across the balcony. The LD controlled the lighting from a ChamSys MQ 100 connected to the network, changing the intensity and colour temperature of the fixtures on each floor via the console remote. The final summing up comes from Hawthorn’s Sean Ferris. “Søren was fantastic, and highly creative. Everyone walking past the building was taking pictures and the whole event created a good deal of attention,” he stated. 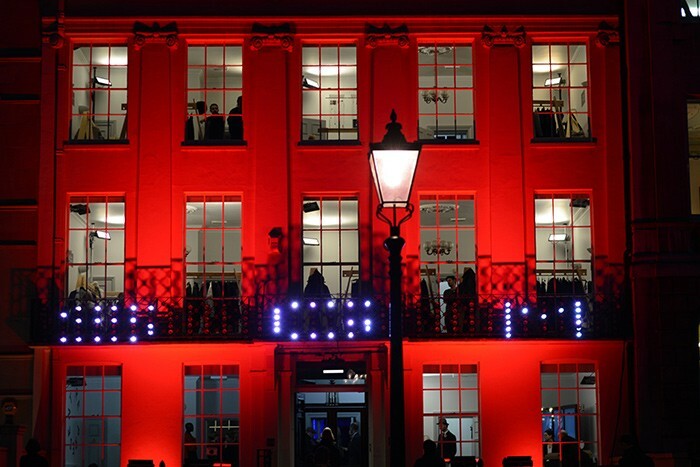 In picture: SGM LED effects on duty at the Danish Embassy during London Fashion Week.